In a remote corner of southeastern Ohio, those interested in history will feel fortunate to stumble upon U.S.S. Shenandoah Trailer Museum. This small, but very nice, camper trailer nearly overflows with historic memorabilia, which the Rayner family began organizing for display back in the 1980’s. Rayner’s Towing Garage in Ada, Ohio has a fantastic collection of items related to the Shenandoah Airship crash back in 1925, and the historical marker out front explains the story of the crash. Commander Zachary Lansdowne had been warned not to take this particular flight due to the rapid changes in Ohio weather during September. But on its tour of midwestern state fairs, he wanted to fly the immense 680′ zeppelin over his family home in Greeville, Ohio where his mother was living at that time. Bryan and Theresa Rayner were eager to share their knowledge on a recent visit to their museum. Theresa, who works at the local post office, attempted to have a commemorative stamp made on the 80th anniversary, but that wasn’t possible due to government disaster regulations following 9/11. Therefore, for the 85th anniversary, the post office did have a commemorative post card developed. Part of the airship landed on the family farm of Bryan Rayner, who developed his interest way back at the age of three when he went with his grandfather to take people to the crash site at their farm.. Unfortunately, Bryan recently suffered a severe heart attack and now joins those who died in the Shenandoah crash. 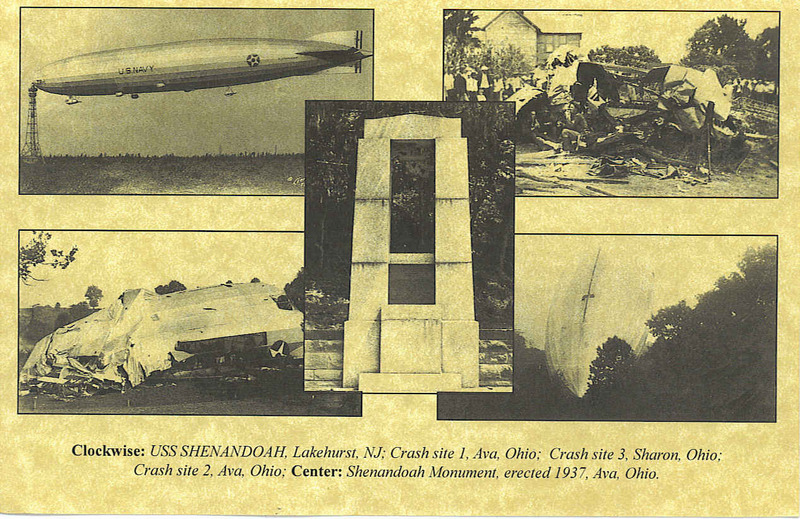 The walls are covered with pictures and stories of the 1925 crash of the famous airship, Shenandoah. There were actually three places where major sections of the airship fell to earth. The stern section of the ship crashed near Ava and a memorial can be seen from I-77, heading south, between the Buffalo and Belle Valley exits. The control car crashed on nearby Andy Gamary Farm, while the bow section drifted a bit farther south to Sharon, Ohio along State Route 78. The Shenandoah was built for naval purposes and not designed for luxury travel. Frequently while on its missions, it would be tied to a naval carrier in the ocean. When released it could float away above the clouds. By lowering a “spy car” just below the clouds, it accomplished its missions of reconnaissance on enemy ships and subs. The skeleton of the ship was made of aluminum girders with the fabric covering coated with silvery aluminum paint. Inside the ship there was actually a long walkway, along which the crew could sleep and eat. There were twenty gas cells with their outside covering being made of cotton and the inside made of “goldbeaters skin”, the stomach lining of oxen. 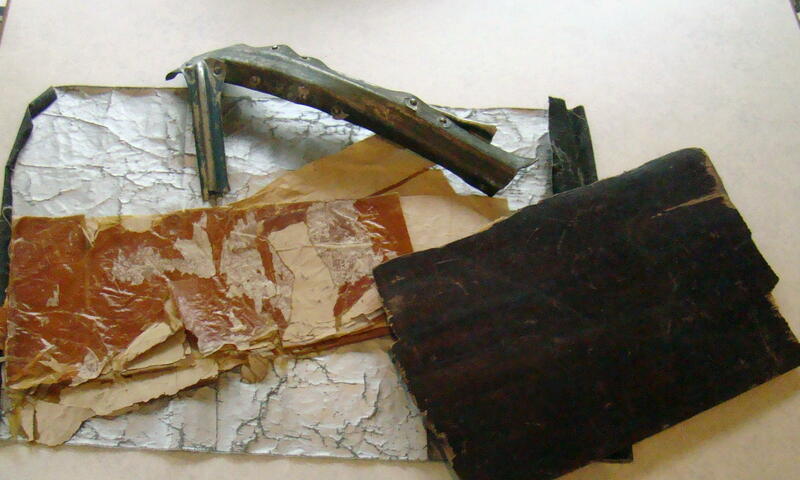 Pieces of all these parts are available to see and even touch inside the museum. Most are behind glass, but they feel it is important to have young people especially, be able to touch the original pieces to gain a better feel for their historic importance. The Rayners took items to local schools in Noble County to share the story with the children over the years. They even set up a 12″ walkway, which was the actual size of the walkway inside the airship, for children to duplicate the experience of the limited space inside. Glass cases are packed with memorabilia that has been gathered from many sources. Some items have been donated to the museum and others have been purchased. Old 78 records with songs about the Shenandoah, such as “The End of The Shenandoah”, have been collected. Sheet music of “The Wreck of Shenandoah” can also be viewed. 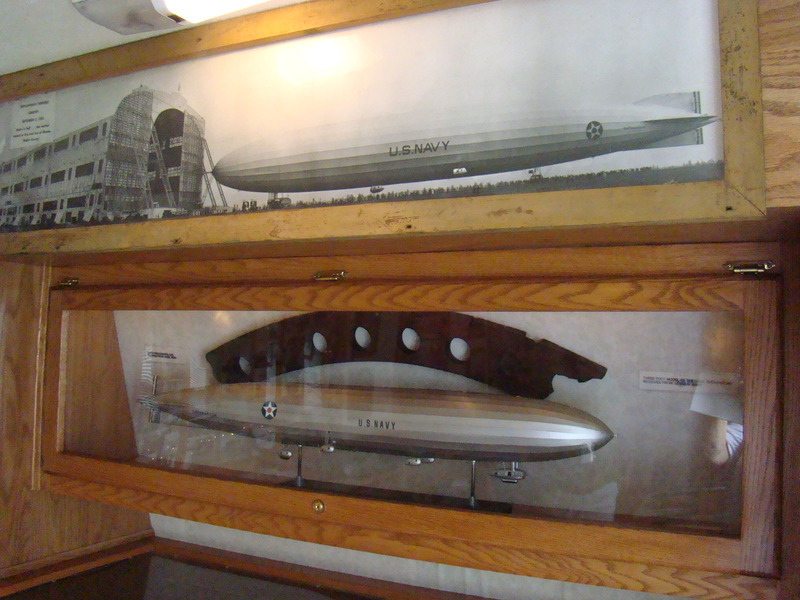 A large collection of rings made from pieces of the airship fill a special exhibit case. 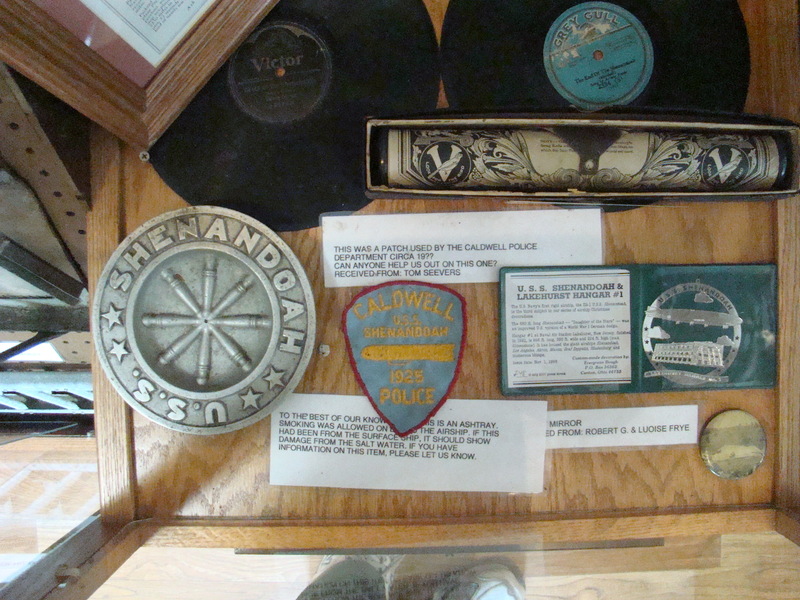 Some were purchased as gifts for Bryan, who had a real passion for keeping the memory of the Shenandoah alive. You might be surprised at the number of visitors who have toured the U.S.S. Shenandoah Trailer Museum from all over the United States, Canada, England, Australia, and New Zealand. Over the years many, who actually lost family members in that crash, stopped by to leave a piece of history and view the grand collection of memorabilia. On the 2013 anniversary of the crash, Commander Zachary Lansdowne’s granddaughter and family visited the museum. This is one of those times when an individual or two have made a real difference in the world by keeping alive the stories and events of the airship Shenandoah. The U.S.S. 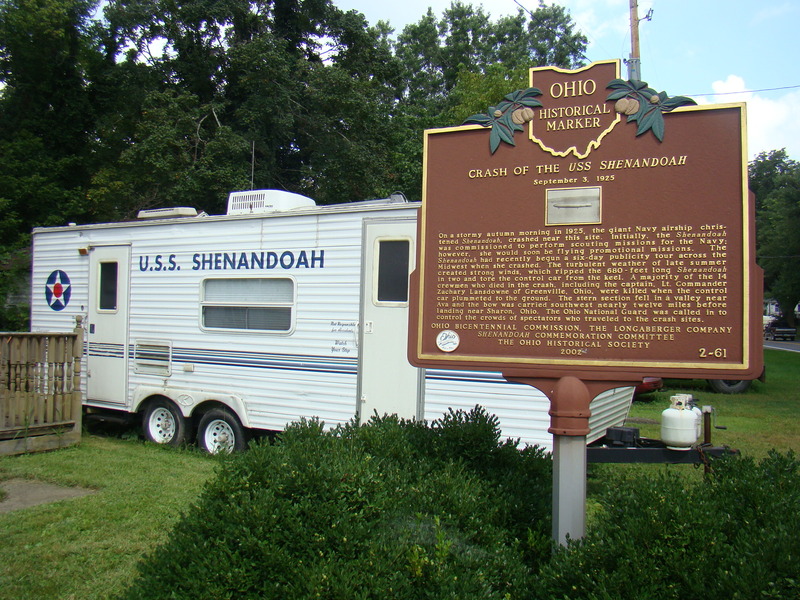 Shenandoah Trailer Museum can be found in Ada, Ohio just off I-77. To visit the Shenandoah crash site, take I-77 to Exit 28 , Belle Valley. From the west side of the interstate, take Hwy 821 North 5 miles to Ava. The monument is on the north side of town on the east side of the road and well marked. Rayner’s Garage and the Shenandoah Trailer Museum are on the south side of town. The museum has limited open hours.